Employees at Lenco, an armored car manufacturer, work on SWAT trucks, popular with police departments, at its plant in Pittsfield. Newtown, Conn., had been the site of one homicide in the last 13 years until a man wearing a bulletproof vest and fatigues, carrying three guns, shot his way into an elementary school and killed 26 women and children last month. For some, such a devastating attack reinforces their belief that police should have advanced defense equipment at their disposal. For others, the inability to forecast an evil act strengthens their resolve that taxpayers should not spend millions to outfit police in low-crime areas with military-grade gear. 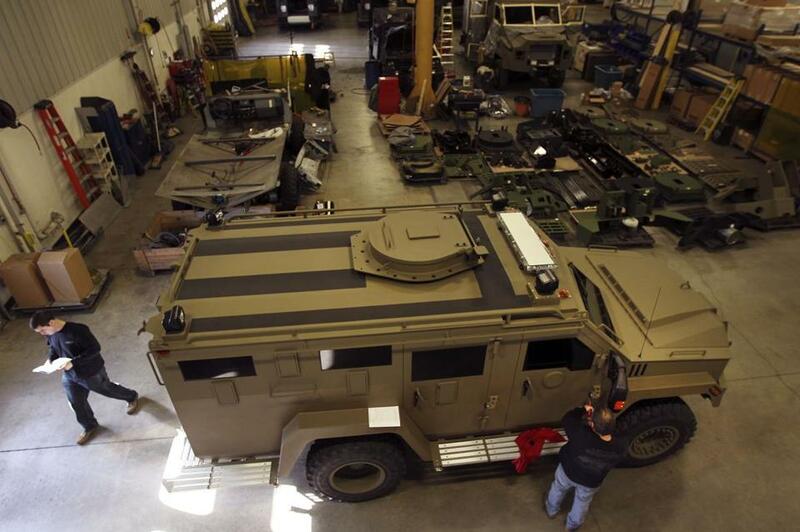 Lenco Armored Vehicles of Pittsfield is in the middle of this long-running debate. Lenco is the nation’s leading maker of SWAT trucks, including two that responded to the shootings in Newtown. The vehicles it has manufactured for hundreds of police agencies across the country also are used by the FBI and all four branches of the military. Since the Department of Homeland Security launched the Urban Areas Security Initiative in 2003 — with a mission to help “high-threat, high-density urban areas” prevent and respond to “acts of terrorism” — tens of millions of dollars in grants have helped pay for the purchase of Lenco vehicles by law enforcement agencies, some in places that don’t meet any conventional profile of a terror target. The exact spending total is unclear because Homeland Security does not maintain itemized records of grant-funded purchases, a department spokesman said. In a report published last month, Senator Tom Coburn, an Oklahoma Republican, concluded after a yearlong review of the program that many grant-funded purchases of Lenco vehicles have been “boondoggles.” In some cities that have sought federal dollars to pay for the trucks, public officials and activists have accused Lenco of exploiting the grant program for financial gain. Lenco directs prospective clients to the Urban Areas Security Initiative, which can foot part or all of the bill, and helps to write grant proposals that present the company’s popular BearCat trucks, which cost $250,000, and its larger BEAR trucks, priced at more than $400,000, as essential tools. Critics contend that Lenco markets its bulletproof behemoths to wide-eyed police chiefs who covet SWAT trucks the same way a tee-ball player might pine for a Louisville Slugger — lacking the need to use it or the means to acquire it. In Keene, Clark and a group of residents opposed adding a BearCat to the local police fleet, saying the department has no need for an eight-ton, armor-plated truck with a blast-resistant floor and 3-inch-thick window glass that can withstand hits from a .50-caliber rifle. But Lenco president Len Light insists such complaints make little sense after the mass shooting in Newtown, a small community with minimal crime, much like Keene. A Lenco Monroe County Sheriff's Department armored truck dropped off residents who were evacuated from the neighborhood, in Webster, N.Y. Dec. 24 after a former convict set a house and car ablaze ito lure firefighters, then opened fire on them, killing two. 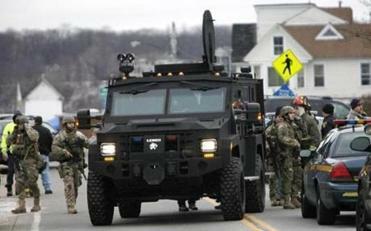 In Newtown, a pair of Lenco armored trucks enabled a state police tactical unit to approach Sandy Hook Elementary School without fear of being struck, said Lieutenant J. Paul Vance, a department spokesman. The gunman, 20-year-old Adam Lanza, shot and killed himself as the SWAT team closed in on a classroom where Lanza had murdered 6- and 7-year-olds. He had enough ammunition to kill everyone in the 670-student school and might have taken many more lives had police not gotten to him so quickly, authorities have said. It was another school shooting, the massacre of 12 students and a teacher at Columbine High School in 1999, that launched a major market for SWAT trucks like those made by Lenco. Light’s parents founded the firm in 1981 with a focus on making bank trucks. A self-described gun enthusiast, Light bought out his parents in 1992 and used his reputation as a ballistics expert within the industry to move Lenco toward heavier duty vehicles, at first for foreign clients. For Russia, it was armored trucks that could repel fire from AK-47s. For Colombia, it was riot control trucks that could be fitted with water cannons. Light surveyed American law enforcement agencies and discovered many were using military surplus vehicles called Peacekeepers for their tactical units. Peacekeepers were armored yet inexpensive. But they were also cramped, hard to exit in a hurry, and they lacked the visibility police wanted at the scene of a crisis. Lenco rolled out the BEAR — an acronym for Ballistic Engineered Armored Response — in January 1999. Three months later, Eric Harris and Dylan Klebold went on a 49-minute rampage at Columbine, killing or wounding 34 people before committing suicide. “That’s what led us down that road of focusing on SWAT trucks,” Light said. He added that when Homeland Security grants became readily available after the terrorist attacks of Sept. 11, 2001, his business boomed. Light — still sporting a full head of hair at age 60 — adorns his office with plaques from police departments that credit Lenco vehicles with saving the lives of officers and civilians. His eyes mist when he recalls handshakes from cops whose only shield from a psychopath’s bullet was a BearCat’s paneling. “I think it’s really cynical,” said Kade Crockford, director of the Technology for Liberty Project at the American Civil Liberties Union of Massachusetts. Law enforcement officials who use Lenco vehicles argue that the men and women who risk their lives for public safety deserve the protection afforded by the trucks and say the vehicles have been important additions, even in communities where Coburn reported that grant money has gone to waste. For example, a police SWAT team in Fargo, N.D., has used its BearCat in 11 dangerous situations since 2009, said Chief Keith A. Ternes. The sheriff’s department in Waukesha County, Wis., has deployed its BearCat 30 times in 18 months, most notably when white supremacist Wade Michael Page shot six people to death at a Sikh temple in August. In Webster, N.Y., last month, a BearCat evacuated 30 people from a neighborhood where a convicted killer set fire to his house and met first responders with a barrage of gunfire, killing two firefighters. Locally, Milton Police Chief Richard G. Wells Jr. called the BearCat his department shares with 42 other agencies in the Metropolitan Law Enforcement Council a “life-saving device.” MetroLEC SWAT teams used the truck 26 times in 2012, mostly for drug busts and to execute high-risk arrest warrants.